"This is my mom's recipe for tacos. I really enjoy the way she seasons her meat. Her seasonings are way better than those store bought packs." Crumble the ground beef into a 1 1/2 quart casserole dish. Cover with glass lid. Cook in the microwave for 5 minutes on High. Drain, and stir in chili powder, salt, garlic powder, cayenne pepper and water. Cover and return to the microwave. Cook for another 3 to 4 minutes on High. 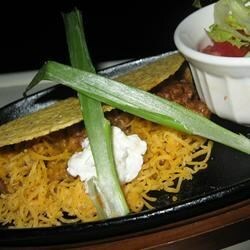 Fill each taco shell with about 2 tablespoons of the ground beef, then top with desired amounts of cheese, lettuce, onion, tomato and taco sauce. Delicious tacos without the tortillas. I added 1 tsp of cumin. I followed the recipe to the tee and it was great. The whole family loved it and it didn't taste any different than stove top cooked meat. This was good, but wasn't quite as good as the package (a modest standard at best). I added 1 tsp of cumin which helped make it better, but something else is missing - not sure what.